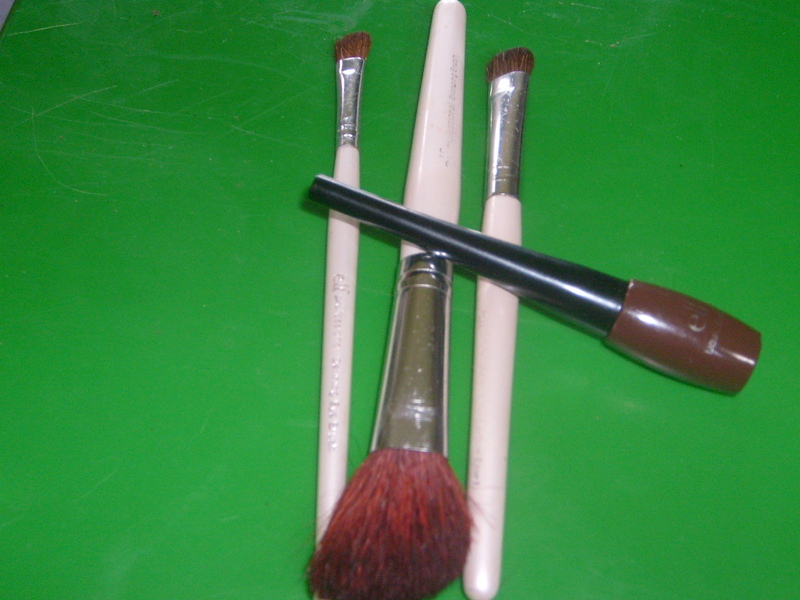 Make-up brushes and eyeliner from E.L.F. I am an all out bargain shopper. All of my friends and family all want to go shopping with me, because they know that when I come home from shopping it is with a bag of stuff that cost me next to nothing. I have already mastered shopping in stores, now it is time for me to conquor the world wide web. I have found a few items that are priced very cheaply. I have found 2 sites that offer products that I reccomend and use; well I am waiting for my waist cinecher from Orchard Corset. But as for E.L.F. (eyes lips face) I use there make-up; it is dirt cheap I’m talking as low as 1.00 an item, and the make-up is good. I was introduced to E.L.F. a couple of years back. I was shopping at a Burlington Coat Factroy and I saw this smokey eye shadow kit that included an eye lash curler. I forgot how much I paid for it, but I am a bargain shopper so I know it wasn’t that much. I loved the smokey eye that I got from the kit. That was the last time I saw the make-up…. At least untill now. I sae mak-up brushesin Dollar General, I know the name brand E.L.F. so I purchased a few. I did my make-up and used my brushes as soon as I got home, and the 3 brushes that I have work absolutely wonderful. I reccommend them to everyone and anyone to use. Once you try E.L .F.you will be hooked. Trust me. The brushes work just as good as any other professional brushes. I have Revlon professional brushes, and I am here to tell you E.L.F. works just as good. If not better. On top of the brushes the make-up lasts all day. It is worth a try. You should definetly visit the site. Once you visit the site be sure to sign you e-mail address up to recieve exclusixe offers from E.L.F. That is also worth doing. Everyday I get an e-mail with a coupon code to use during the check out. The only down side to this is that you can only use one coupon per order. One of the current specials are but 1 item get 1 50% off. You have to spend at least 20.00 to use the coupon code. This offer expires today so… Visit the site http://www.eyeslipsface.com/ and buy E.L.F. Besides make-up I have found a site that offers corsets, shapeware, lingure, and a host of other items. There is something on the site for everyone. The site is currently offering a long torso waist cincher for 6.99 on clearence, as well as a short torso waist cincher for 6.99 on clearence. Check out the link http://www.orchardcorset.com/Cortland-1001-Long-Torso-Waist-Cincher_p_14516.html to check out the long torso waist chicher and see what you find. As like all other sites if you sign you e-mail addres up you recieve exclusive offers and coupon codes to use when you checkout. I hope that these cheap finds are usefull to you. I also want to know if you already use either of the products? If you do let me know are you a constant user, and what are your feelings about the product? You can also give me any other type of feed back. I hope you enjoy!! !